It’s hard to cram that much character into an affordable car. 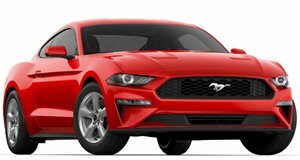 The sixth generation Ford Mustang was a complete game changer for the pony car, and not just because it was getting an independent rear suspension. It’s because this was the car that was supposed to be the ambassador of the American muscle car to the rest of the world. As such, Ford tried and, in our opinion succeeded, to nicely blend the unrefined character of muscle cars with the sophistication that the rest of the world wanted while keeping both contained in an affordable package. However, some of those compromises had their drawbacks. See, Americans actually like the type of non-refinement that’s present in muscle cars because it’s a reflection of real life, not just another postmodern car where the machine does everything for the driver and tries its best to subdue any unpleasant characteristics like that geeky friend that tries too hard to fit in with the rest of the group. Meanwhile, Europe sees those traits as unattractive. Of course, the sales figures are what dictate the outcome, but trying to cram that many personalities into a car that starts at $25,000 means that corners were cut. As a result, there are plenty of areas where Ford went wrong with the new Mustang. Here are five of the most prominent.